I think the name Carrot Cake Recipe is a little deceptive in terms of what the name might mis-communicate. Some people think the name is strange and are reluctant to try eating a dessert containing carrots. 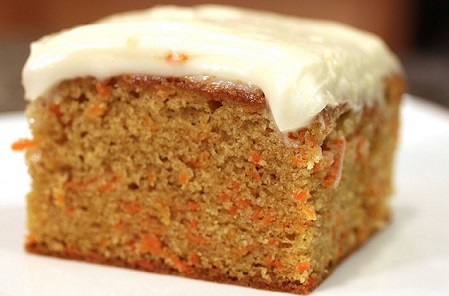 It may be surprising but you really don't taste the carrots in the cake batter. 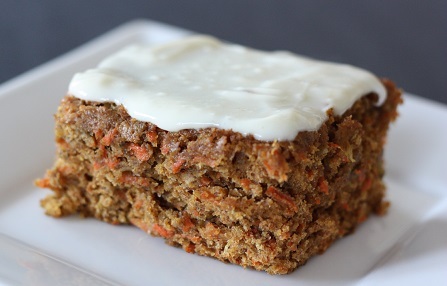 This carrot cake is a moist and flavorful dessert with grated carrots and a delicious cream cheese frosting. Actually, the use of carrots in desserts goes back to the middle ages, so it is not a new invention at all. But the popularity of carrot cake was rekindled during World War II because of food rationing. Carrots were easy to grow in your yard. Then again, people started eating more carrot cake in the 1960's and 70's, some say for health reasons and some point out that the dessert is not only delicious but also not too expensive to make. In 2005, the Food Network listed a carrot cake recipe with its cream cheese frosting, as number five of the top five fad foods of the 1970s. Why, besides availability, use carrots in desserts? Carrots contain more sugar than any other vegetable besides the sugar beet which may explain its use in desserts. 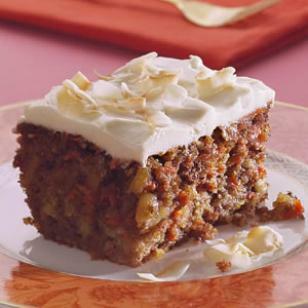 This recipe for carrot cake has grated carrots, pineapple, raisins, vanilla extract, cinnamon and nuts, highlighted by a delicious cream cheese frosting. Many carrot cake recipes include additional or different ingredients such as applesauce or coconut. This dessert recipe can be a layered cake or even muffins, but I most often prepare it in a 9 x 13 x 2 inch pan. Enjoy your Carrot Cake and the company of those you share it with! Did you know? Red, black, yellow, white, purple - these were the colors that carrots started out with. Everything but orange. Carrots were first cultivated in Afghanistan in the 7th century, and they started with yellow flesh and a purple exterior. It was the Dutch who developed the orange carrot, and the French in the 17th who most likely developed the elongated carrot, ancestor of the ones we eat today. The English brought the carrot to the New World.